I’ve lived in one home for 30 years, and that’s a lifetime. It’s taken me five years to face the reality that my boys will not be moving back to our family home. I am no longer deluded about that. Despite this no longer being their primary home, the front hall closet is still stuffed with their coats and gear, their bedroom closets are stacked with clothing, memorabilia and books, and the basement has even more sports and game gear, art supplies and instruments that no one uses. There is no one to blame for this mess but myself and I’m ready to take on the task of purging. I am mentally ready to re-claim my space – there is no reason I cannot create a clutter free home a la Martha Stewart, Real Simple, or the Zen cottages I covet on Airbnb or VRBO. It is within my grasp – I am just a measly 100 garbage bags away from Nirvana. I have accepted that I will visit my sons in their homes and they will “visit” me in mine. Channeling this burning need to declutter and design my empty nest– I took to my closets like a Ninja. It was a no-excuses kind of week. 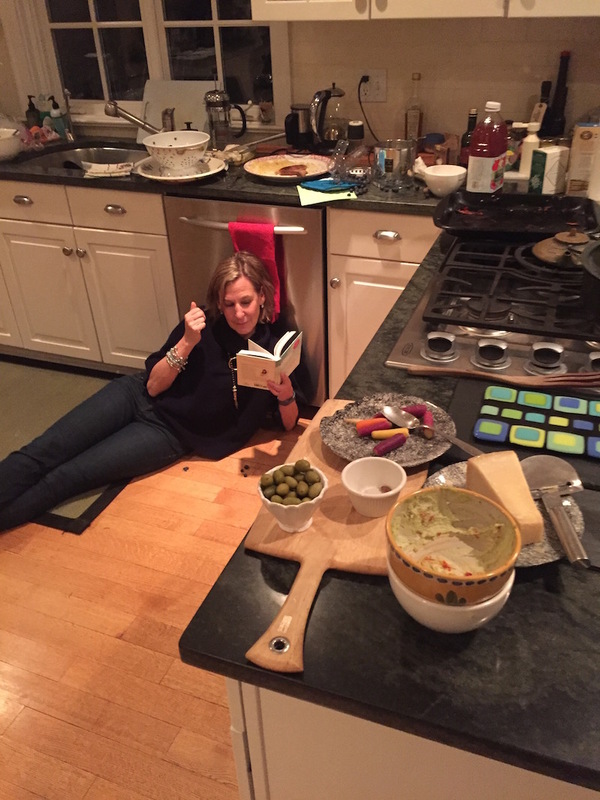 Motivated by a bleak January forecast, my husband out of town for four days, and a light social calendar– I dared myself not to clutter my “cleaning time” with distractions..
All seemed ripe for success. Day One: Monday. It was 9pm (who in their right minds begins a project at 9PM?) and I had returned home from an evening in the city and was energized to take on the front hall closet — it was a mess; full of the kids’ coats, boots, and not a spare hanger for a guest. The Vision: A welcoming closet with space on the rack for a few empty hangers. I would be able to walk into the closet and hang up my coat without tripping over sneakers. Obstacle: I felt guilty about purging my kids’ leather jackets, raincoats, golf shoes and tennis stuff. So, I called one of my boys to talk it through. How do you spell “mistake”? This was my pattern – I was paralyzed for a moment again – that phone call created an obstacle. I feared an impasse with my reclamation project. Why had I called to ask my son’s permission? Uggh! I took everything – I mean everything out of the front hall closet and dumped it in the living room. Whatever wasn’t my husband’s I discarded or put on a clothes rack in the basement. One hour later – just one hour later – I had an adult front hall closet that I could see and walk in to. There were even 4 empty hangers for guests. I was on my way to creating my Zen cottage and I felt energized. I crawled into bed excited about the next day’s project. Day 2: Tuesday. I woke at 5:30 am excited to take on my bathroom cabinets and shelves. I thought –in just 2 hours I will create my very own Zen bathroom that would look like the Four Seasons. Obstacle: My bathroom cabinets were bursting with clutter- old make-up – tangled jewelry—unworn bracelets – old prescriptions, too many hair products were jammed in every available space. Hadn’t I just cleaned out these draws and cabinets last month? I pulled out each drawer and dumped all the stuff on the floor. As I examined the stacks of make-up, I decided to see what I could salvage. I played in my piles of eye liners –old creams –mascaras –sharpened up some old eye pencils and tried on almost all the products to see if I liked them. Two hours later, my face itchy and irritated from all the stuff I had smeared on – my eyes were watery and red from expired products which I may have become allergic to. Smudged and fatigued, I was nevertheless relentless with my purge. 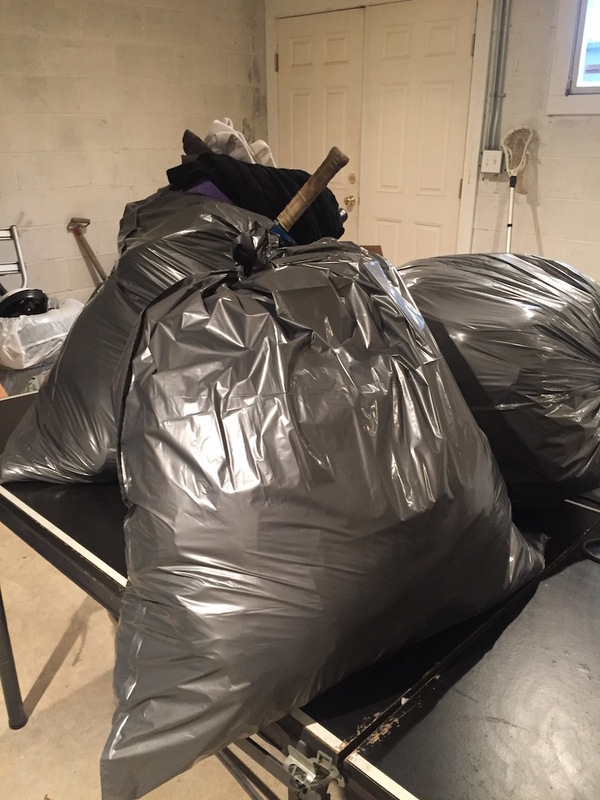 I’d miraculously filled two entire garbage bags of stuff to toss. I declared victory 3 hours later. I was wiped out from the cosmetic purge. With swollen, sore eyes, I pushed through my day surprised by the toll this cleanse had taken. I talked to my friend Cassie who told me about the New York Times best selling declutter book “The Life-Changing Magic of Tidying Up: The Japanese Art of Decluttering and Organizing” by Marie Kondo. I ordered it for immediate delivery and went to bed. I slept like a dead person. Day 3: Wednesday. I decided to take on one of the kid’s rooms. I asked my cleaning lady to come for 2 hours to help me. Clothing was jammed into the shelves although he had not lived here in 5 years. I pulled all his clothes to the center of the room. I had my tools –a large plastic storage box from the Container Store for keepers and a few Hefty bags for donations. Two hours later – with the support of my helper – success! The center row shelves were empty – a welcome to any guest. Not a tear was shed. Surprisingly the neutering of his room was delightful. We dragged four hefty bags of donations to the basement and placed them on the Beer Pong table labeled for pick up by the Boys and Girls club. Success! And then I walked back upstairs depleted and content and sat quietly in this lovely uncluttered room. I was now in my very own VRBO bedroom. Amazon delivered my declutter book that evening. I couldn’t wait to read it. Day 4: Thursday. I awoke at 6 am and read the entire new Japanese de-clutter book. Oh boy –I had only done #1 and #2 properly, but I was out of order without a category approach and the Joy thing had eluded me. I needed to reboot because this Japanese system made sense but …. I wasn’t sold on the “joy” concept. Hmmmm- that was helpful indeed! I picked them up, they felt rough – they were not my favorite –they did not make me feel joyful — I put them in the discard pile. “I can do this,” I thought. I can do the Joy thing. Next week — I’m piling all my clothes in one room and I’m going to touch them – talk to them and “feel” what I want to keep and discard the rest. I will commit to being surrounded by joy. Today I’m taking the day off from de-cluttering and cleaning. I’ve had enough! Here’s the link to Marie Kondo’s book on Amazon (Best book of 2014 in Home category). It’s a great feeling isn’t it? Most of this “stuff” means more to me than my kids. It is a process to let go. What is that GORGEOUS blue – green – black thing laying on the counter to the right of your cooktop? That is a fused glass spoon rest. I know because I do fused glass and I make those! That’s so true – it’s a glass spoon rest and I use it for appetizers too. I got it on Martha’s Vineyard at the artisan fair in Tisbury. I love it and glad you do to. I understand completely as I have started to declutter because we want to sell our McMansion and move into a 55+ community. It’s always good to have a goal to keep you going — such a challenging task and not as much fun as accumulating. I enjoyed the onformation. I will look fo the joy in getting rid of all this clutter .My husband died twenty one years ago. I’ve gotten rid of alot of things. but more needs to be done. it’s a process and hope you are making progress Pat. I know how emotional that can be — it’s not just about cleaning up and clearing out. Way to go Julie. Now you are motivating me to get back to the next room and start filling the bags again.